Arrange an outing with a neighbour! Throw a party! Invite some friends! Recite some poetry! Make a speech! Tell some jokes! Tell a story! Take a trip! Into the bush! 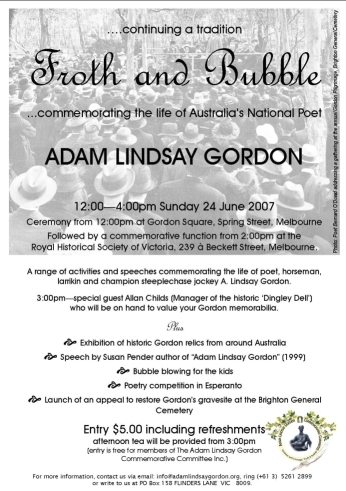 Adam Lindsay Gordon celebration at the SA Writers Centre 2nd Floor, 187 Rundle Street, Adelaide Friday 22nd of June. 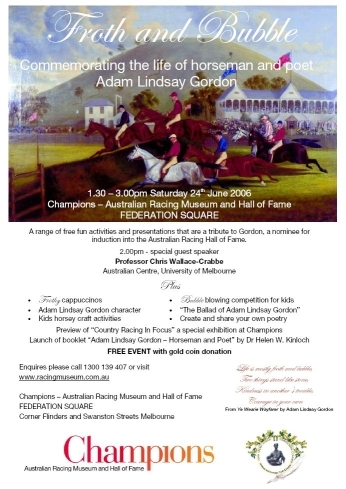 Featuring Lorraine Day author and Geoff Dening performing "The Ballad of Adam Lindsay Gordon".